This is a sponsored post in partnership with Swiffer. All opinions are my own. Every parent has heard that one line. You know the one, "I promise I will take care of it." But we know better. It doesn't matter with it's a dog, cat, bird, guinea pig, or alligator. Those words that our kids utter trying to get parents to say "yes" to a family pet are famous, or maybe infamous is a better word, because they are usually forgotten a week or two later. Thankfully, with a little gentle prodding (or threatening to shut off the wifi), there are a number of ways that kid can easily take care of a family pet. In our house the family pet is a dog named Shasta. 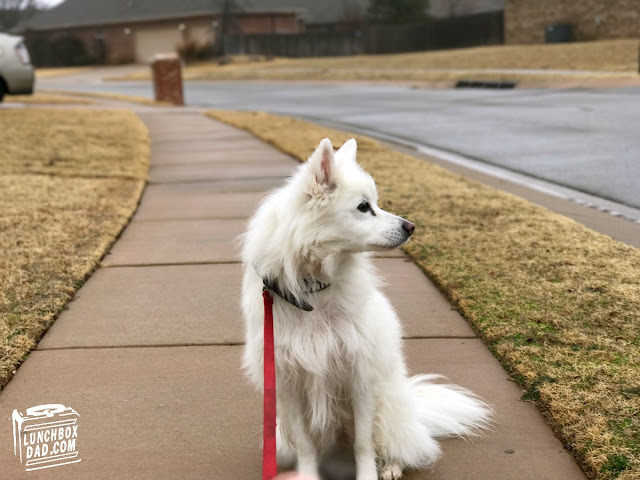 He's a twelve-year-old American Eskimo dog who likes to shed like it's going out of style. His white fur is magically magnetic to black clothes, but he is part of the family. Once our kids reached a certain age we decided that enlisting them to help take care of the dog would not only help out the family, but it would help teach them some responsibility. So we came up with some tasks that were age appropriate, and let's be honest, tasks that my wife and I would rather not do. Shhh don't tell my kids that though. Hopefully these ideas help you as well! 1. Feeding time, because animals need to eat for some reason. If you've ever had a dog, and are late feeding it that day, you know the look it gives you. The dog sets it's chin on your leg and gives you that wide eye and droopy face, trying to make you feel as though you are the worst person in the world. If you look close enough, you might see a small tear roll down it's little doggy cheek. As a parent, you don't need that kind of guilt in your life. Pass this on to the kids who are six and older! If they can't fill up a bowl with water, and dump nuggets into a dish, then well, you might have bigger parenting problems. 2. Clean up fur, fur, and more fur. Have I mentioned yet how much our dog sheds? It's worth mentioning again. In twelve years, we have tried every product imaginable to cleanup the dog fur. Here are the tools that work the best. 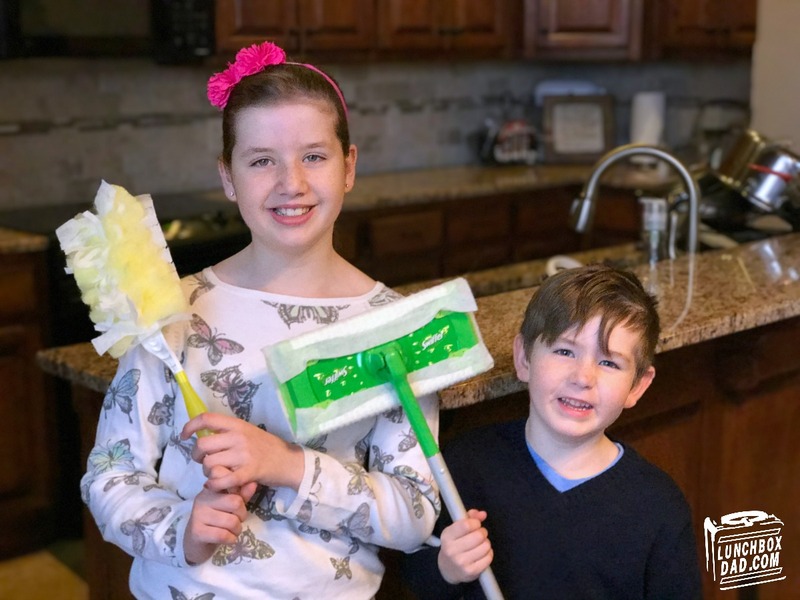 The Swiffer Sweep+Vac and the Swiffer Duster. What? You didn't know that Swiffer makes a rechargeable cordless vacuum that uses Swiffer pads? 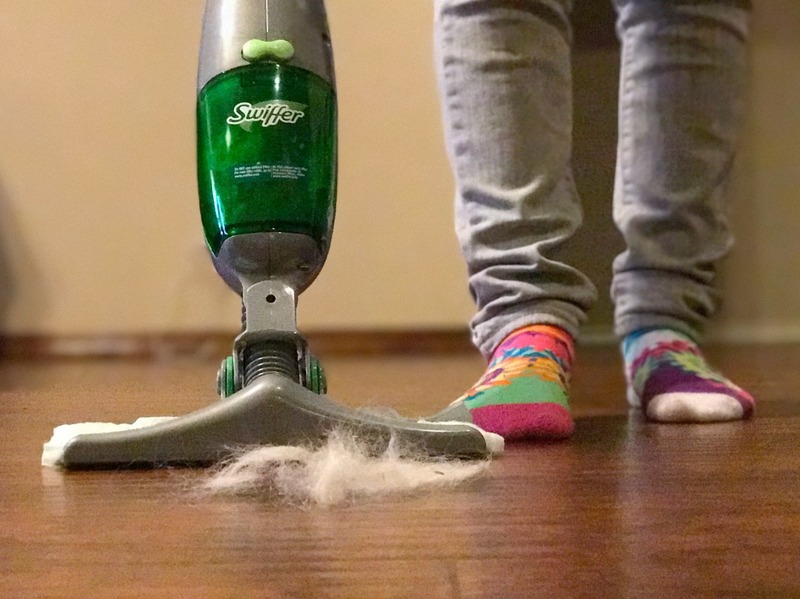 It not only vacuums up all the dog hair on the floor, but my kids have fun using it. The Swiffer Duster pretty much collects all the fur, from the ankles on up, that lands on the furniture and blinds. These two tools pretty much make any kids rockstars of dog fur cleanup...if that's a thing. If it's not, I just made it a thing. 3. Brush the dog and acquire a new fur coat. This is actually the next thing that we will teach my oldest to do. She is not quite there yet. There is usually enough fur collected after brushing to create another dog. The fantastic part is how the fur swirls around you and clings to every piece of clothing that you are wearing. It's not that I don't enjoy being covered head to toe with white fur after brushing the dog, but I just don't want to deprive my daughter of this joy. I'm a giver. 4. Take the dog for a walk, or have the dog take the kids for a walk. Either is acceptable. One reason I love our neighborhood is because there is a nice walking trail and park right by our house. When the weather is nice, it is fun to get the whole family outside for some exercise. Sometimes our kids take the dog for a walk, sometimes he takes them for a walk. Either way it helps all of them burn off energy and there's absolutely nothing wrong with that. 5. Put on flea medicine, because fleas. You have kids. You have a dog. You don't need fleas as well. Show your older kids how to put on one of those tubes of flea medicine once a month. Also stress the need to wash hands afterwards. This might take a little more teaching in order to be safe, but it then becomes one less thing you need to worry about. Unless you want more stuff tho worry about. It's really up to you. 6. Pick up dog poop. I know, getting out of this one is the best! This is pretty much a no-brainer. What adult wants to pick up poop outside of their house? When you have a toddler you're already cleaning up poop inside the house. This is one of the first things we had my older kids start doing. 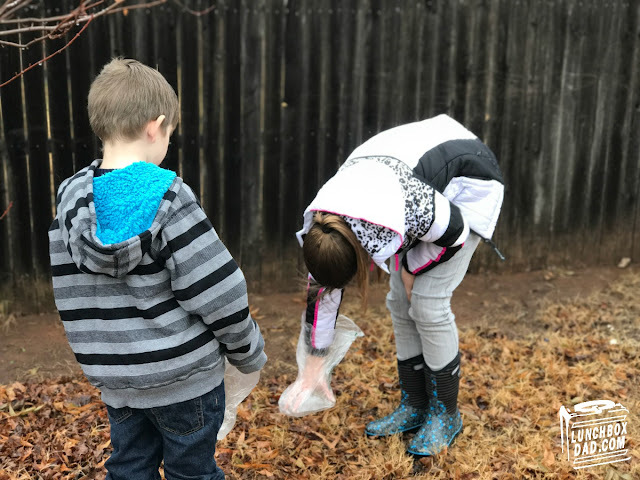 We save plastic grocery bags and the kids use them to clean up the backyard. As soon as your child is old enough, this is the perfect job for them. 7. Give the dog and kids a bath. Because they both need it. It's always a parenting win if you can kill two birds with one stone. Put your kids in the bath and put your dog in at the same time. You will need to stay with them, but they can be the ones to soap your dog up. You will probably need a life jacket because most of the water will be out of the tub and forming a lake in the bathroom, but at least you're being efficient with your time. 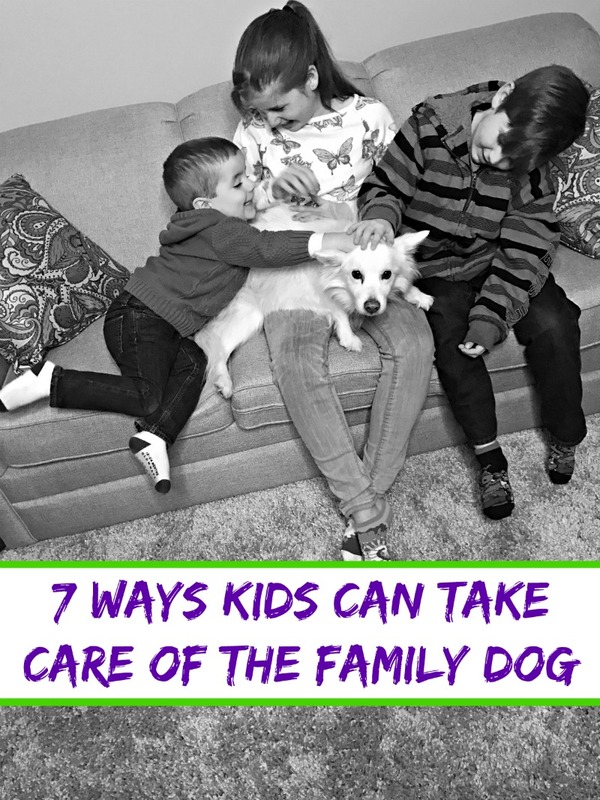 As you can see there are a ton of areas where your kids can help take care of the family dog. Don't be afraid to give them some responsibility and also help them learn to take some ownership. All you need are some plastic bags, brushes, a Swiffer Sweep+Vac (or a Swiffer Sweeper), and a Swiffer Duster! What are your tips on ways that kids can take care of pets? Let me know in the comments!